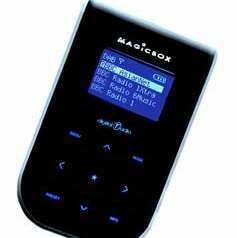 Here's the perfect summer gadget, for whiling away hazy afternoons in the park while listening to 6Music or the cricket on your new handheld Touch DAB from MagicBox. The touch sensitive design is the company's response to the "endless stream of pine box or retro look digital radios available today" and – clearly – inspired by the runaway success of Apple's iPhone and iPod touch. "Not a fiddly knob or dial in site," claims the press release, "the sleek panther black radio is driven using a black TOUCH panel at the front but a sleek stainless steel backing." The blue backlit controls also light up (handy if you happen to be in a cupboard or a dark nightclub!) and the handheld radio also has a useful on/off lock button to avoid flipping stations. MagicBox also tells us that the mini DAB is ideal for 'mucky conditions' like gardening "where the panel can be easily wiped clean with the cover provided."